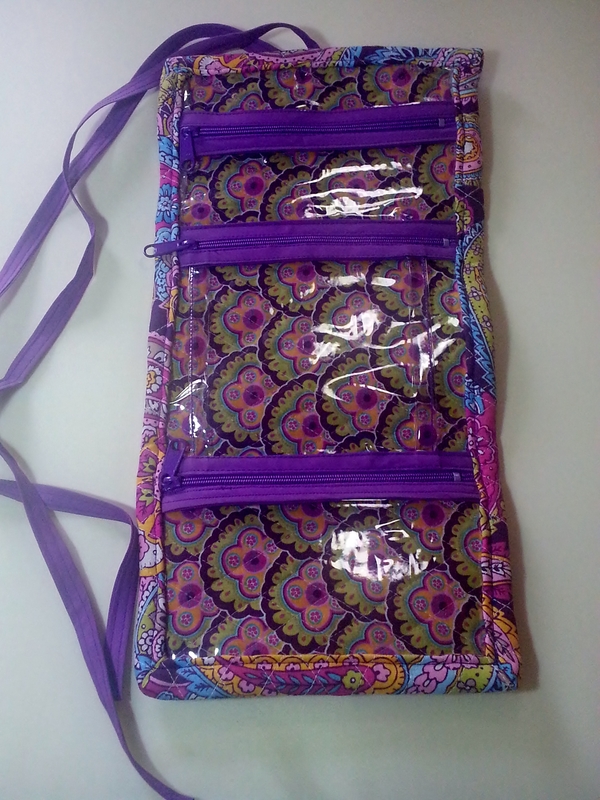 The quilted trifold three zipper pouch can be used to organize whatever you want. Great for those who love to quilt or you can use pre-quilted “double faced quilted” cotton fabric. The vinyl pockets allows you to view the contents and are easily cleaned with a cloth. The tutorial will take you through the steps to create this pouch for yourself or to give it as a gift. Happy Sewing! 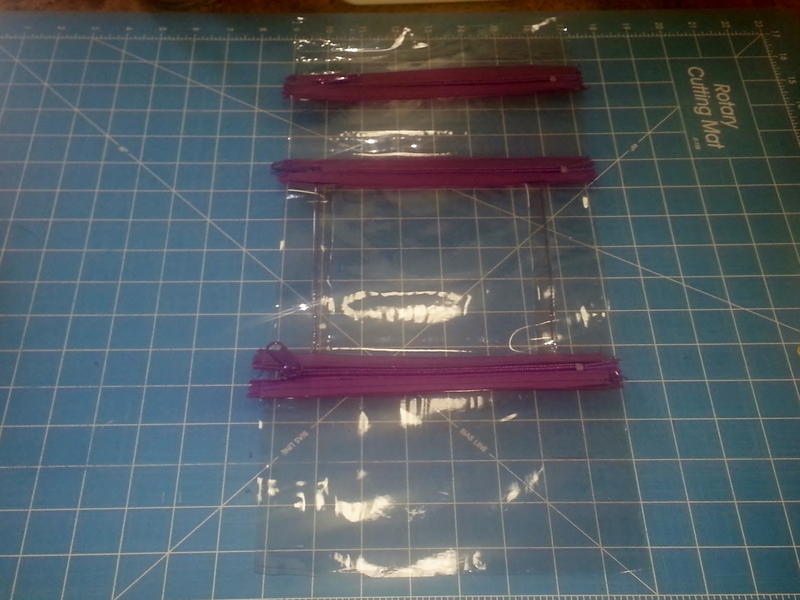 Cut (6) Strips of Bias Tape 8″length (use remaining bias tape for the bag tie). Bottom pocket: Make 1/2 inch fold on the top of the vinyl pocket and place the fold in between the bias tape strip. Center on the zipper bottom and sew two seams 1/4″ on the top and bottom of the bias tape . Fold each 1″ pleat toward each edge of the pocket. 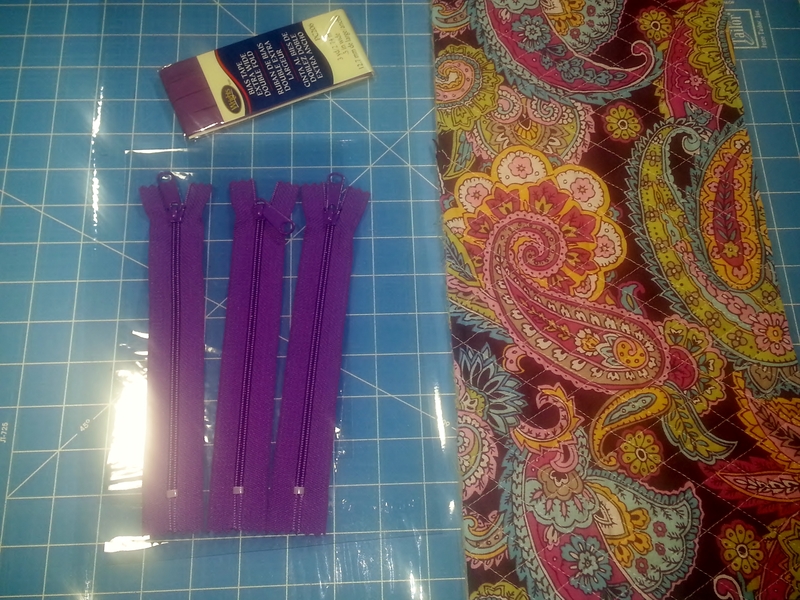 Fold the bottom of the vinyl 1/2 inch toward the front of the pocket, place the fold in between the bias tape strip, center on the first zipper and sew two seams 1/4″ on the top and bottom of the bias tape . Fold the top of the vinyl top 1/2 inch toward the front of the pocket, place the fold in between the bias tape strip, and center on bottom of the zipper second zipper. 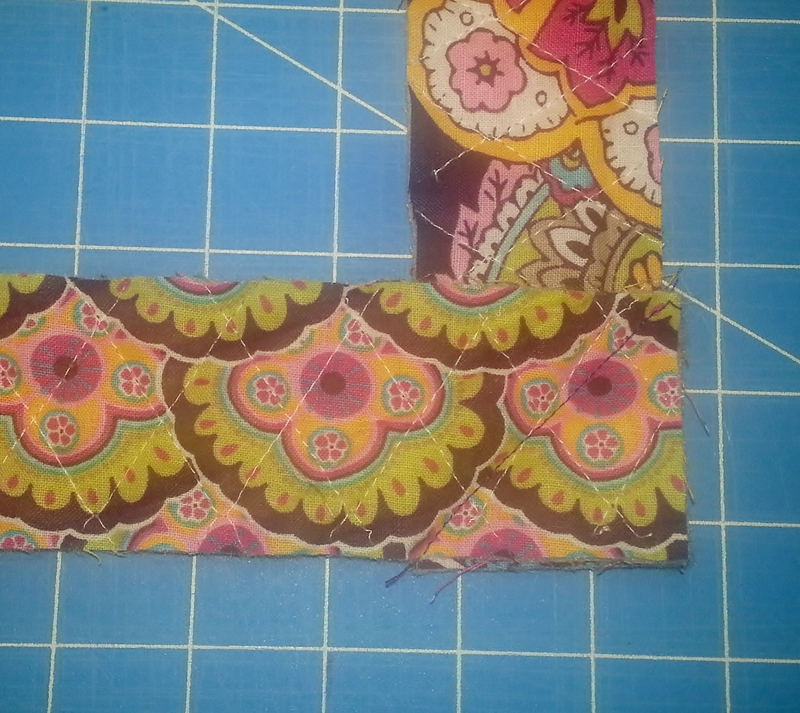 Sew two seams 1/4″ on the top and bottom of the bias tape. 2. Attach the vinyl pockets to the vinyl lining by placing the finishing zipper seams at the bottom of the top pocket over the existing seam stitches and the bottom of the middle pocket. 3. Sew the four binding fabric strips together creating one continuous binding. Place the front sides together on one end of the fabric strip creating a “L” shape and sew diagonally across the end of the strip from left to right of the strip. Trim the fabric approximately 1/4″ away from the seam. And repeat to complete the binding. 4. 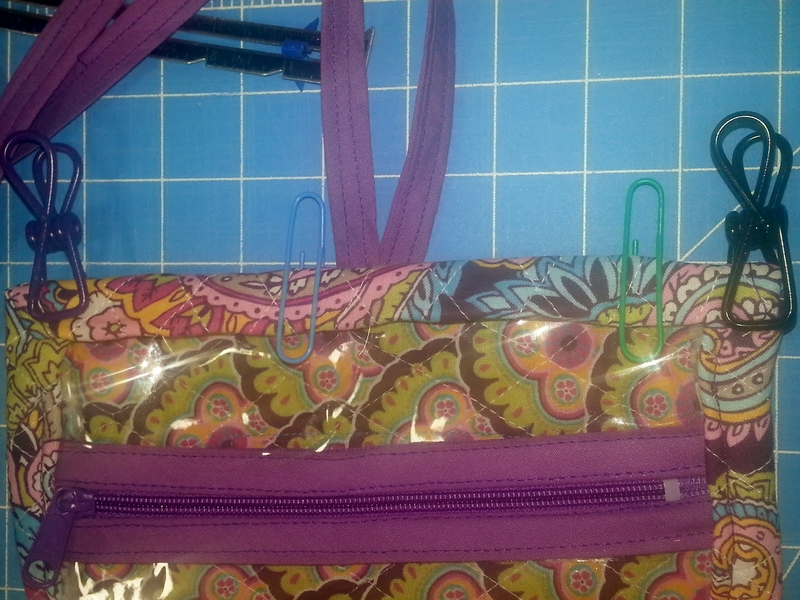 Grab the remaining bias tape and stitch along the open edge or both sides if you like to finish the bag tie. 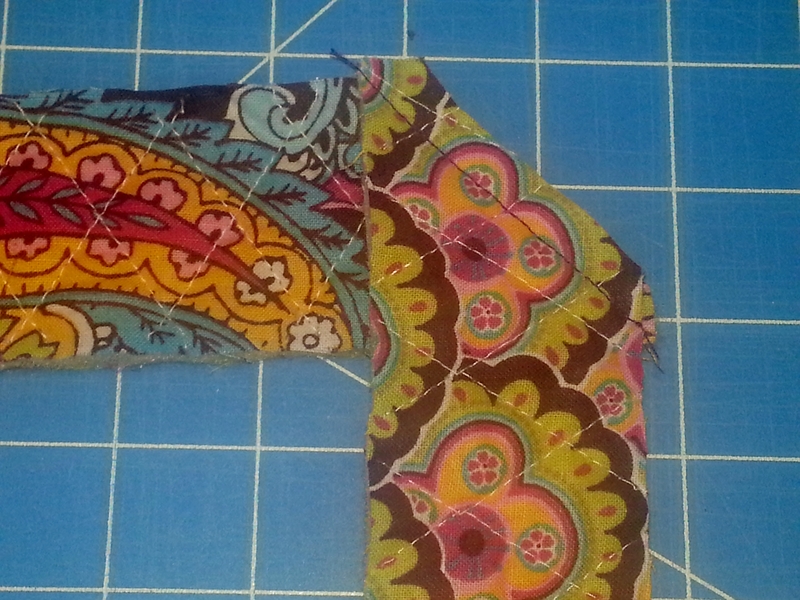 Fold the tie in half and double stitch 1/4″ seam on the fold on the top center of the front panel. 5. 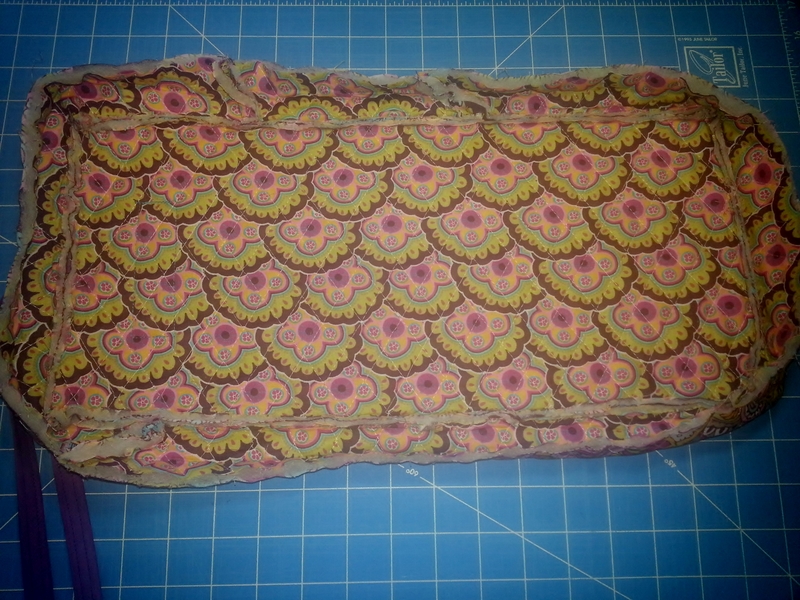 Sew the binding trim to the pre-quilted fabric 3/4″ seam allowance starting from the middle of the side front panel. Start sewing the trim 1/2 inch from the beginning of the binding trim. Sew the trim to the first corner of panel and remove from the sewing machine. 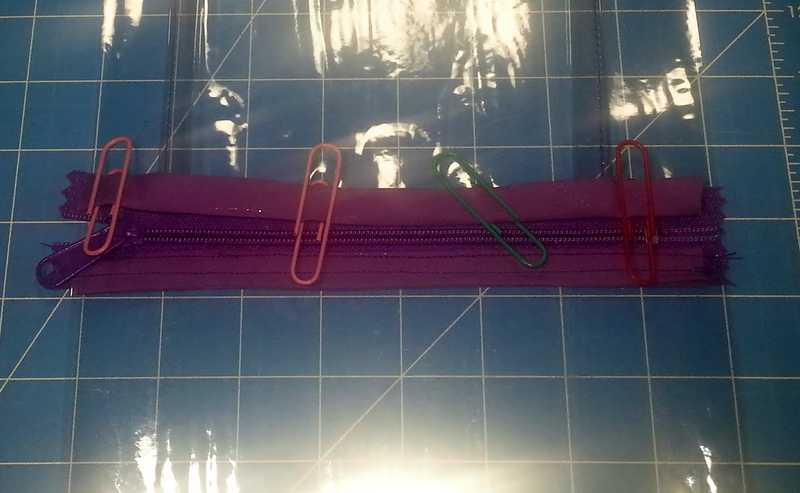 Fold the binding trim flat across the next corner pin in place and sew to the second corner. Repeat the process until you’re near your starting point. 6. Press the seams toward the edges of the panel, fold the binding trim in half and press the fold to use as a guide for finishing seams. 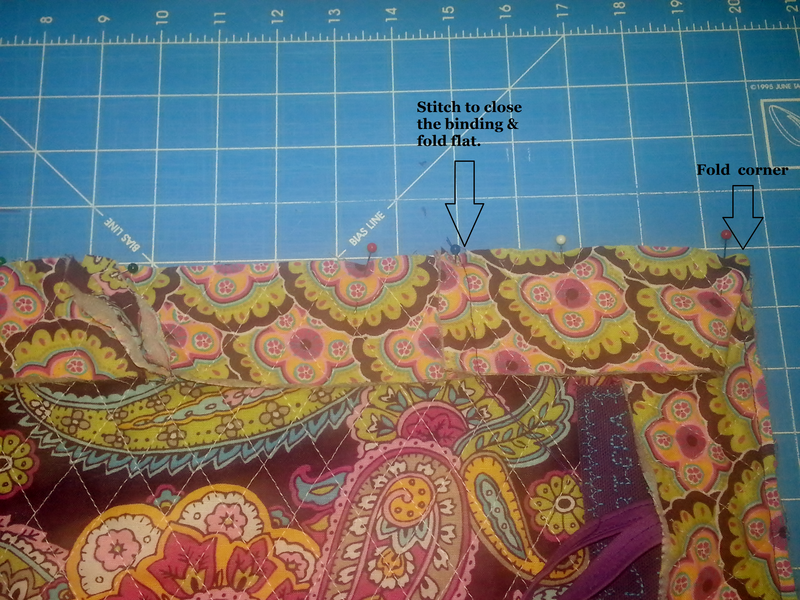 Make sure you sew the binding closing seams flat. 7. Place the vinyl lining against the backside of the panel and fold the binding trim on top of the pockets. 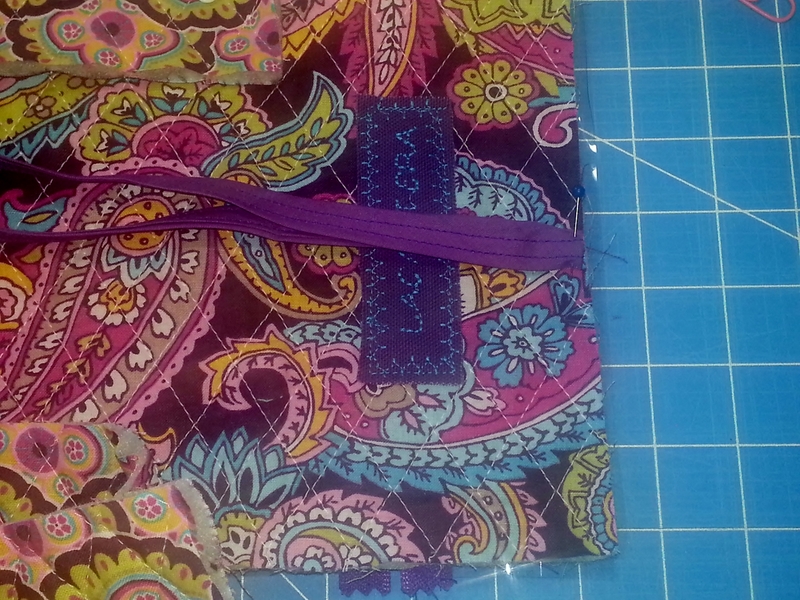 Ensure the binding trim is folded to cover the original binding seam to create 1/5″ border. Tuck the corners and watch out for the metal zipper parts. 8. Test the pockets to ensure that the vinyl pockets are secured under the binding. 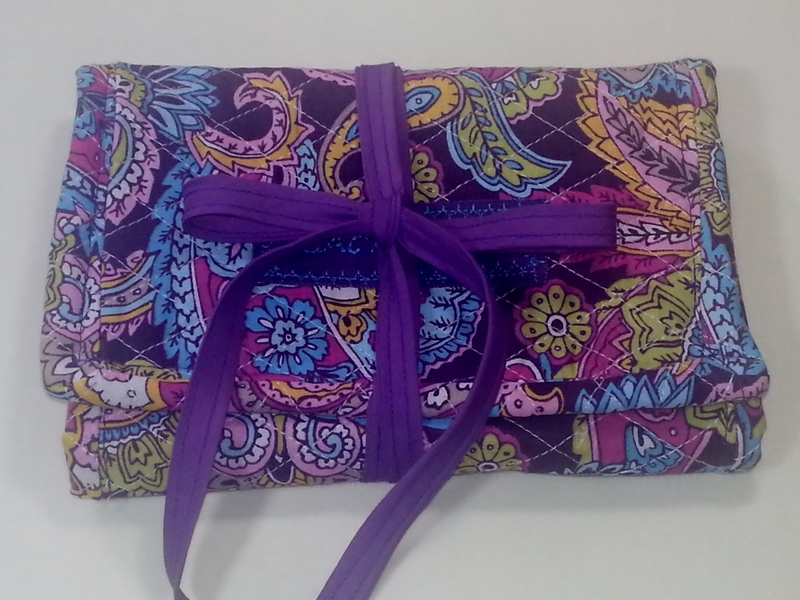 Please share a picture of your finished pouch with me. 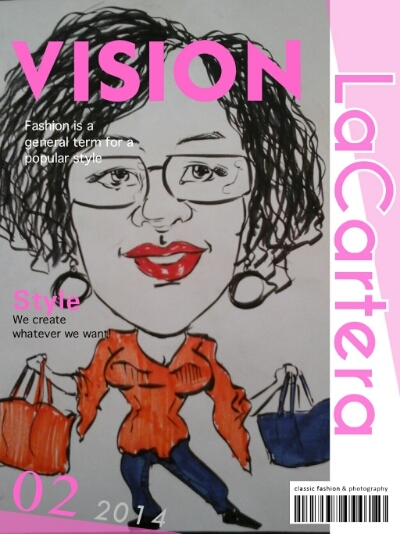 Post a blog link or contact me via email with your pictures. Next Post Quilted Gift set~ Is it a Hit or Miss? Fab or Drab? I bet. It looks handy. Thank you, Gina! I thought it would make a perfect gift too. Like the colors and patterns. Sooooooooo 1960s .